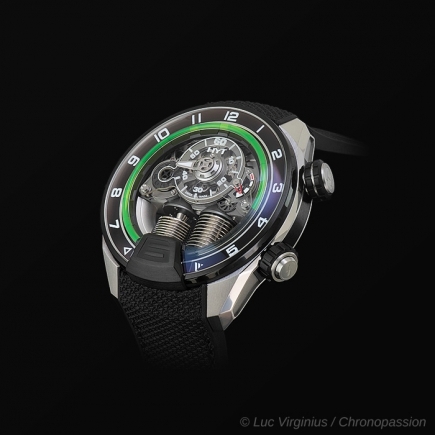 HYT | 280'000 € Tax inc. The world has been waiting for it, but no one knew what to expect. 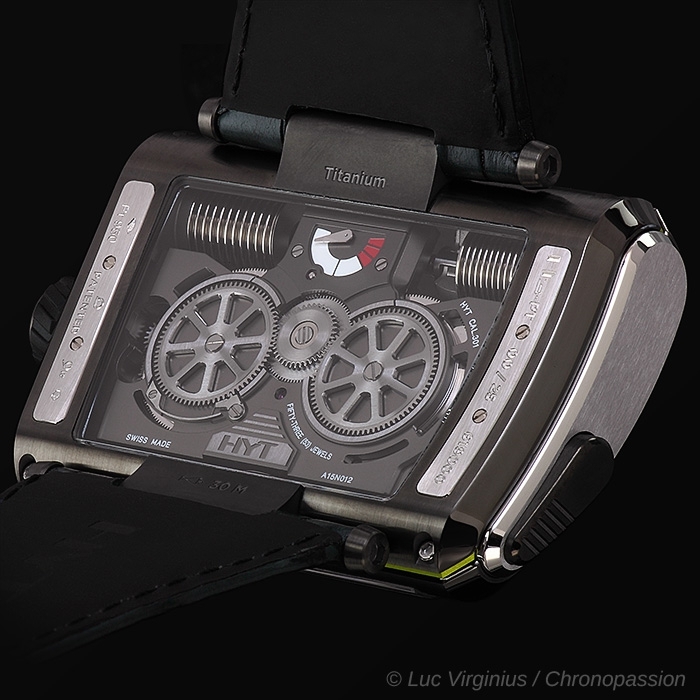 After keeping us on tenterhooks for a whole year, HYT's H3 has now burst onto the watchmaking scene. 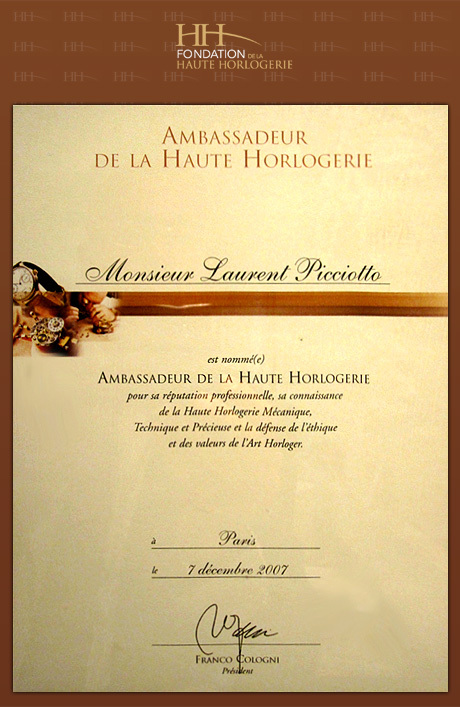 But can we still use the word "horology" to describe it? 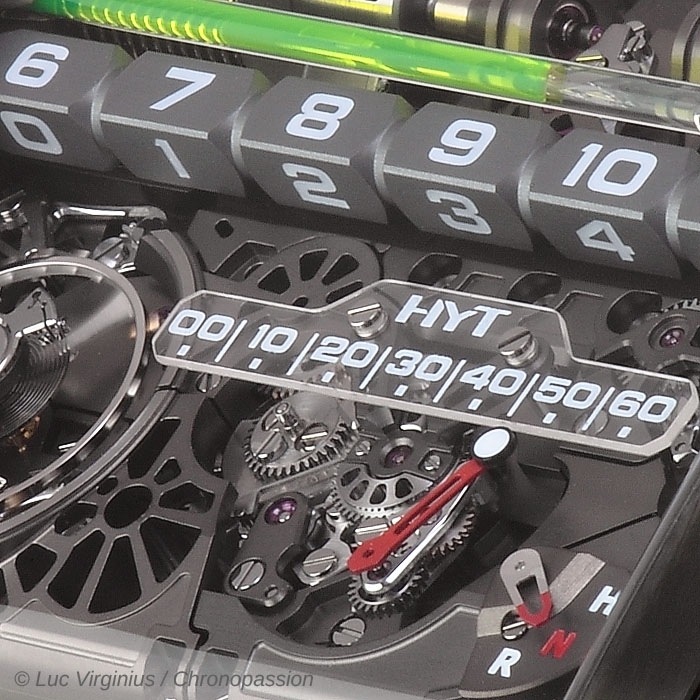 Known for blurring the lines, HYT has once again defied the limits of what is possible. The sculptural H3 is essentially inspired by a fluid portrayal of time, a field which the young independent brand has not only conquered, but one which it has radically (re)created in all areas. 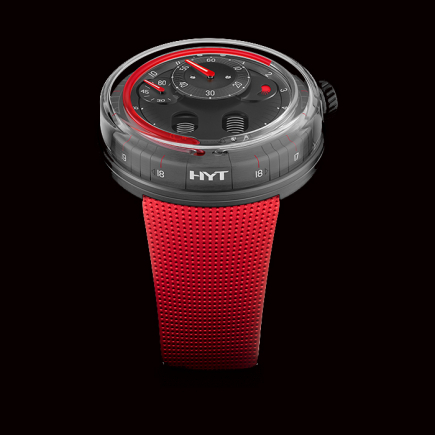 Following on from the H1 and H2, HYT is back and shaking the foundations of watchmaking once more. 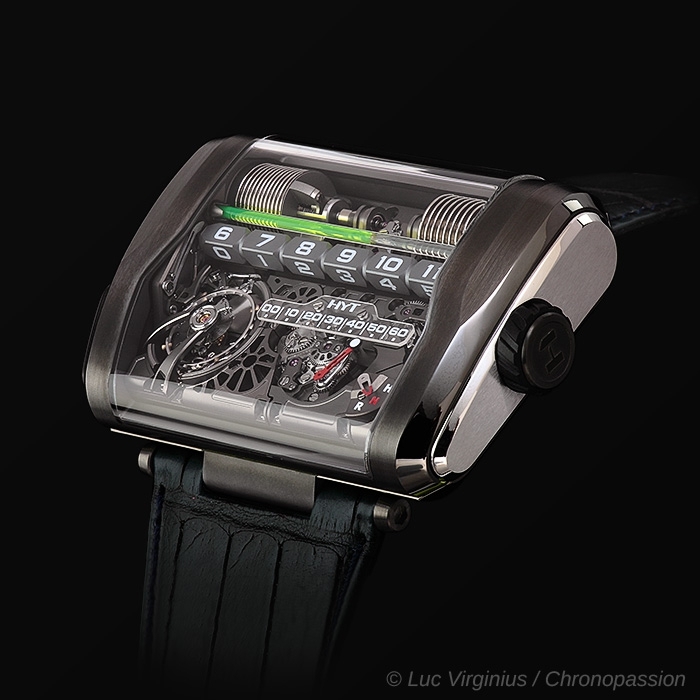 With the H3, the brand is deconstructing time and reconstructing it around its founding principle: two bellows injecting a capillary with fluid which moves to display the time. In the conventional sense, there is no midday and there are no hands. 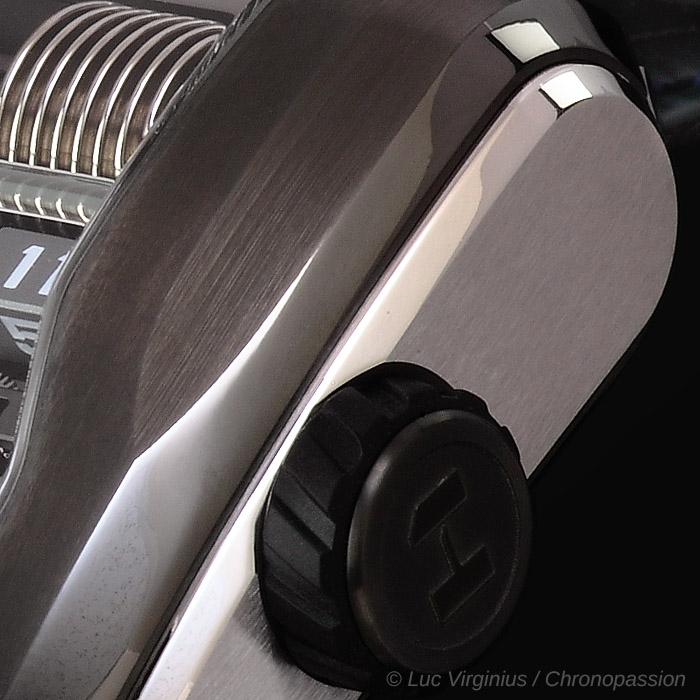 The H3 is reinventing the wrist watch with its case measuring 62 x 41 mm. 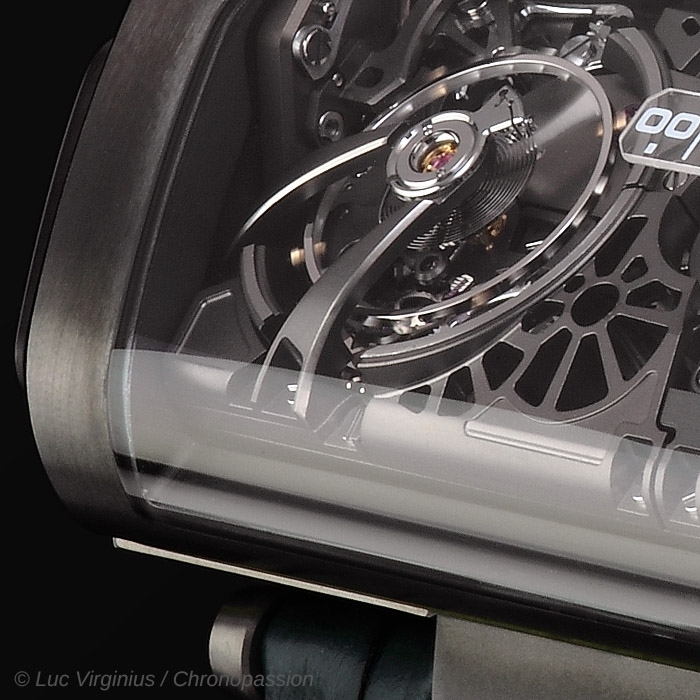 Its bespoke shaped movement is a perfect fit for each contour. 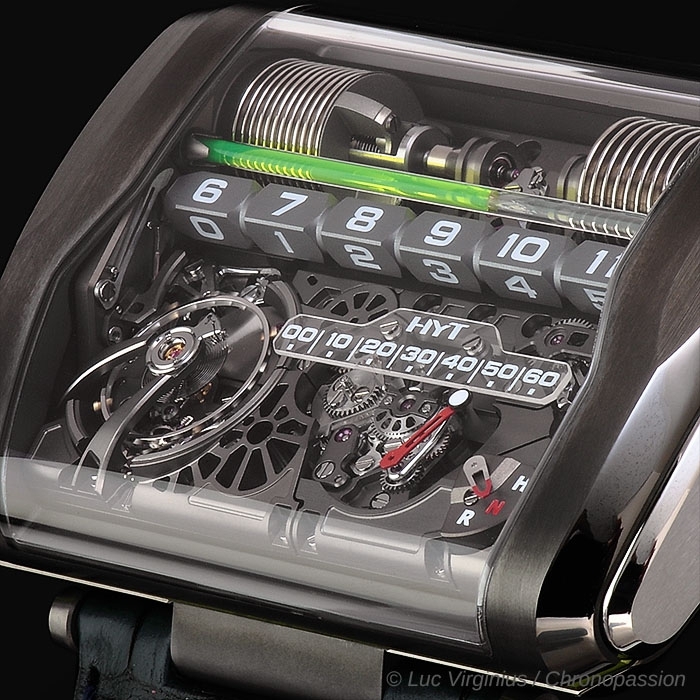 HYT and its partners have succeeded in creating a timepiece with a highly complex architecture. One of the main challenges lay in machining the case and the sapphire crystal. When it came to the movement, one of the most delicate steps in creating the H3 involved recovering the energy provided in the retrograde movement, which then powered the semi-instantaneous rotation of the watch's dial. Its construction was initially inspired by the desire to have a linear portrayal of time, which resulted in a design with the bellows at opposite ends. The movement engineering teams then worked around this constraint – which became the stylistic signature of the H3 – to create the complete calibre. The upper part of this living sculpture houses the bellows mechanism. 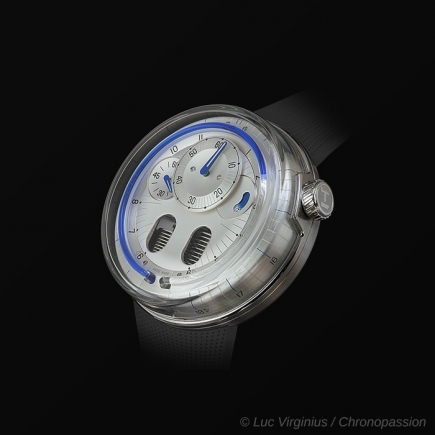 The first, on the left, drives the progression of the fluid and therefore the time display. Its counterpart, on the right, compensates for this progression in the capillary. Less than one millimetre in diameter, this glass tube, operating in a vacuum, still contains two fluids: the first, (waterbased) yellow fluid serves to tell the time; the second (viscous-based) translucent fluid works in opposition. A meniscus separates them. aces is graduated with 6 hours, thereby enabling the 24 hours of the day to be displayed. 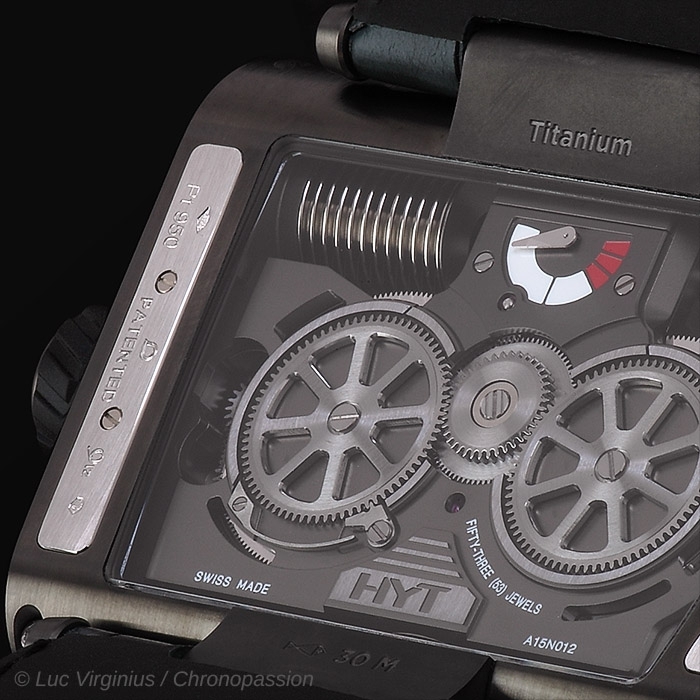 To ensure a harmonious and linear progression between the hours, HYT has developed an exclusive movement. 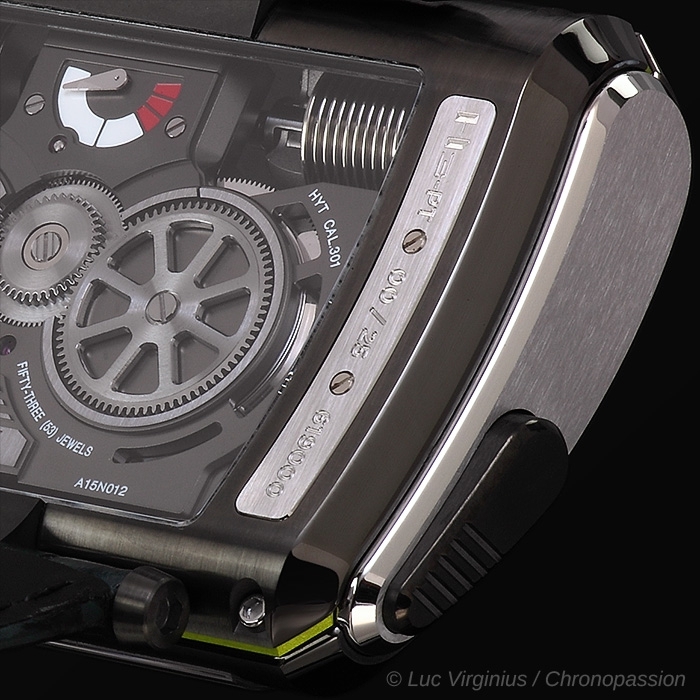 A complication is used to rotate the dial on itself, to display the section concerned for the current time. The other three faces are not visible. 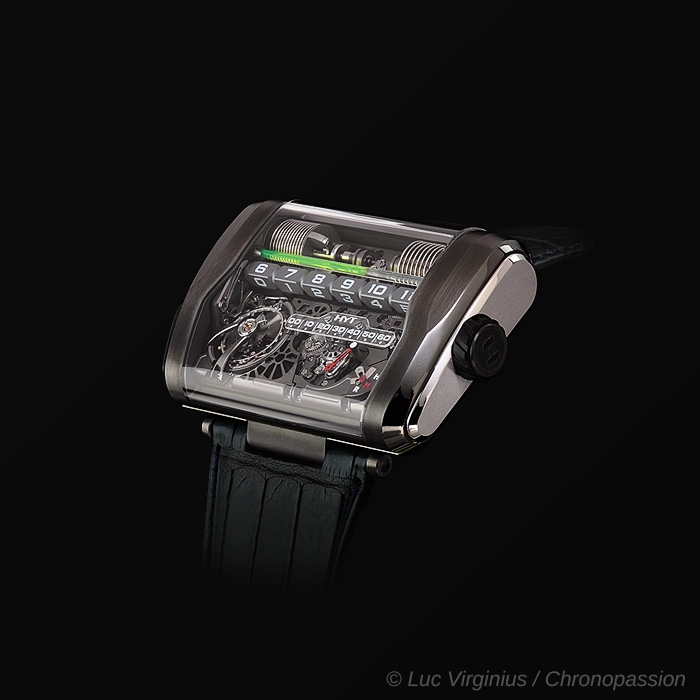 At the end of each 6-hour period, the time display makes a retrograde movement. During this time lapse, the dial begins a controlled rotation, enabling the time display to jump semiinstantaneously. When the liquid's retrograde movement is engaged, the calibre then uses the energy stored in the bellows and provides the force needed by the hour dial movement. 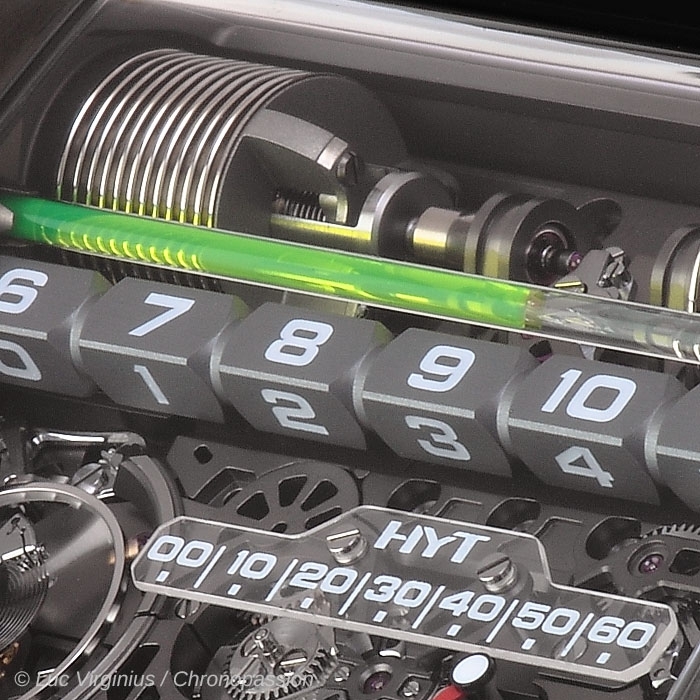 To ensure the technical and stylistic cohesion of the H3, HYT has also developed a linear display for the minutes. 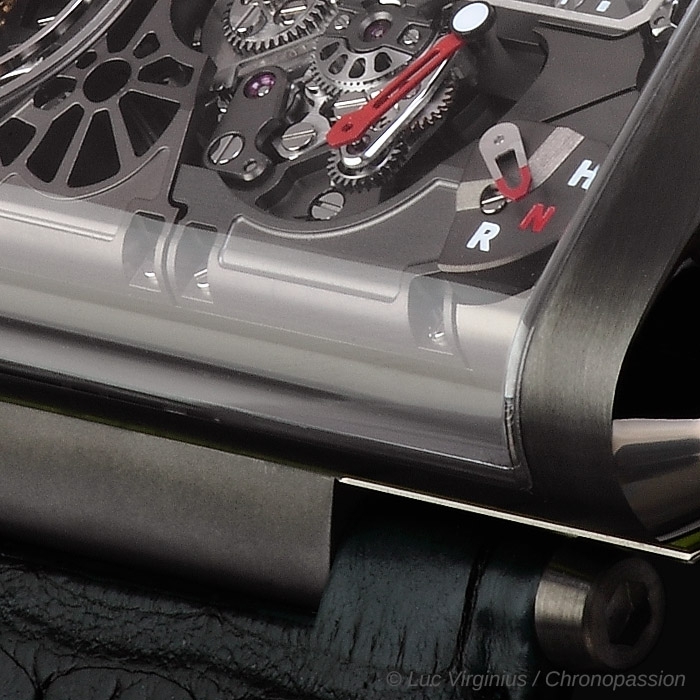 On the lower right-hand part of the timepiece, there is a twin articulated arm which sweeps across a graduated rule. At its end, the retrograde mechanism instantaneously returns to its starting point. The time is set using a push-button, located on the left of the assembly. With each press, the central time display bar turns on itself by one quarter of a turn. This ingenious principle enables the desired time period to be quickly set by jumping in periods of six hours. Next, the circular movement of the crown enables the exact hour and minutes chosen to be set within this period. Each of the H3's vital organs therefore follows its own rhythm, bringing the dial to life as well revitalising time itself. 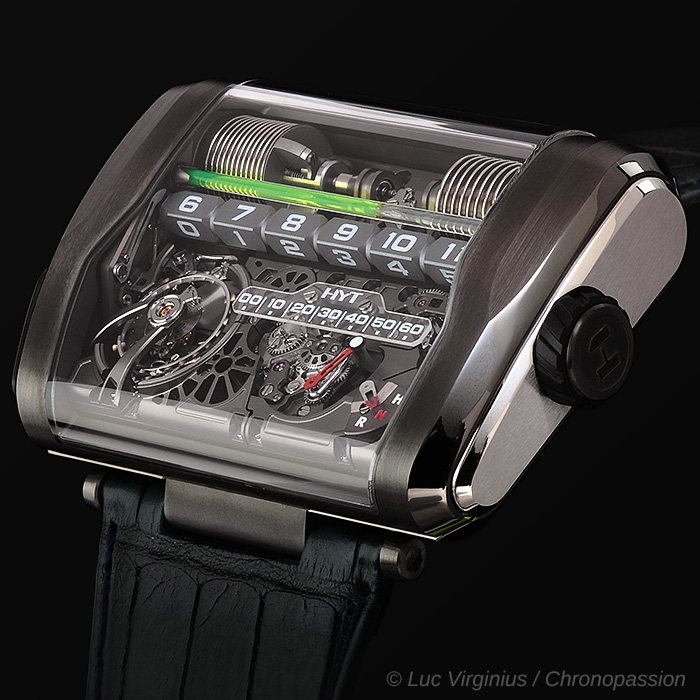 Exclusively composed by HYT, the choreography was once again orchestrated by APRP (Audemars Piguet Renaud & Papi), also responsible for its predecessor, the H2. "We started with a blank page and we capitalised on our fluid experience to create something entirely new", explained Vincent Perriard, HYT CEO. "Placing the bellows in opposition was something that really posed a challenge. They are coupled by a mechanical assembly (comprising a spindle, sensor and thermal compensator), and fitting this between the bellows was a very delicate operation."